20 Feb What is Slow Flow? It is not uncommon to have students ask what Slow Flow yoga is all about and there may be as many different answers are there are teachers. drop in and be still in longer holds which may have yin-like qualities. Slow Flow allows time to find alignment and make subtle (or not so subtle adjustments) as in Hatha. It gives space to play with props and to move in and out of posture. Often people equate slow flow with gentle yoga, and while may be in some instances more often than not may feel far from gentle when we find chair or side plank for 20 breaths, or drop in to frog or pigeon for an extended hold. But I think what resonates most with Slow Flow for me, is that it honors the truth that you are your own best teacher. Slow Flow gives time and space to explore, move, play and challenge yourself in new ways. When you slow down and begin to listen inward you can find what works best for you. This is true both on the mat and in the world. 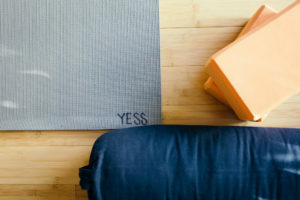 Slow Flow is taught by Elisabeth at Yess on Tuesdays & Fridays at noon and Thursday evening at 7:30p.